Jersey claimed their first victory of the season with a 33-27 win away to Leeds in the British and Irish Cup. Leeds winger Jamel Chisholm strode in for the opening try but the islanders were 15-10 ahead at the break thanks to the Michael Le Bourgeois' penalties. Guy Thompson's touchdown extended the lead, but replacement Joe Graham scored to keep the hosts in touch. A try from Donovan Sanders saw the islanders pull away again, only for Curtis Wilson's to score late on. 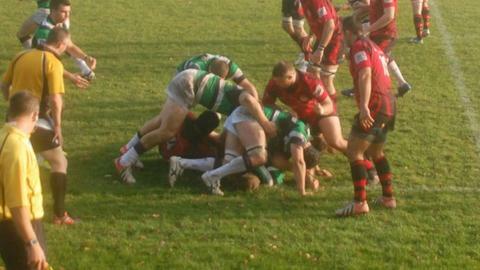 Jersey held on though to secure a morale-boosting win in front of 820 fans at York's Clifton Park. Le Bourgeois was the star for the visitors, scoring with all seven of his penalty attempts, and successfully landing a conversion, to claim 23 of his side's 33 points. The result means Jersey, Leinster and Pontypridd all have six points from their opening two matches in Pool Five. Leeds are bottom with one point to their name.